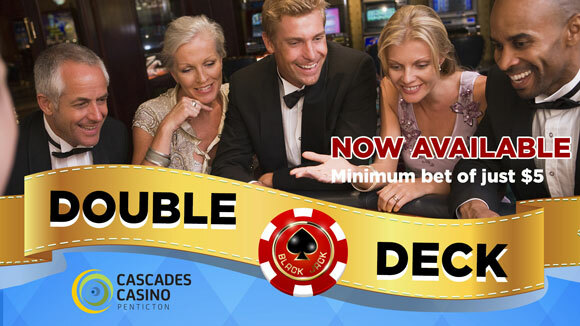 Gaming - Cascades Casino Penticton | NOW OPEN | Eat. Drink. Play. Over 400 exciting slot machines ranging from 1¢ to $1.00, including the latest titles as well as your classic reels. Gold: A province-wide progressive jackpot guaranteed to randomly award a lucky winner between $100,000 and $200,000 at a Casino in British Columbia. Silver: A province-wide progressive jackpot guaranteed to randomly award a lucky winner between $500 and $1,500 at a Casino in British Columbia. Nickel: A site progressive jackpot guaranteed to randomly award a lucky Cascades Casino Penticton player up to $50. Copper: A site progressive jackpot guaranteed to randomly award a lucky Cascades Casino Penticton up to $25. Play our 1¢ Race to Win slots! You could win a new car — guaranteed to be given away to a lucky Cascades Casino Penticton player before the meter reaches 125,000km. We have 14 penny machines that make up this bank of progressive slot machines that randomly pays out two progressive jackpots to lucky Cascades Casino Penticton players! The first jackpot pays out when the meter is between $150 and $250. The major jackpot starts at $750 and must be won by the time it reaches $1,500! Play Casino Cash today for your chance to win big! All machines are coin-less and use ticket-in or bill-in/ticket-out technology. Slot tickets can be redeemed at the Cashier, or one of our many cash-dispensing machines located throughout the gaming floor. Machines only accept Canadian bills, so if you need to exchange your foreign currency, our cashiers will be happy to do that for you!